Denzel Washington will be the 2011 Commencement Speaker at Penn’s 255th Commencement on Monday, May 16, 2011; these individuals will be presented with honorary degrees. Academy Award winner Denzel Washington is one of America’s preeminent performing artists, having achieved wide acclaim for his film, theatrical portrayals, and television, as well as his accomplishments in film directing and television producing. Whether playing South African freedom fighter Steven Biko, boxing champion wrongfully accused of murder Rubin “Hurricane” Carter, civil rights activist Malcolm X, or the homophobic lawyer in the film Philadelphia, Mr.Washington has repeatedly brought to the fore issues and moments that are significant to our global society.He began his career with stage appearances in New York City and a role in a television film before being cast as Dr. Phillip Chandler in the Emmy Award-winning television series St. Elsewhere. He has since acted in a long line of Hollywood successes, directed the well-regarded films Antwone Fisher and The Great Debaters, and produced Emmy-nominated television documentaries on photographer and filmmaker Gordon Parks and baseball great Hank Aaron. Mr. Washington has received the most distinguished honors of his art, including two Academy Awards, two Golden Globe Awards, a Tony Award, an American Film Institute Award, several NAACP Image Awards, and the Stanley Kramer Award of the Producers Guild of America. He also holds honorary degrees from Fordham University and Morehouse College. Mr. Washington has become as well known for his philanthropic role as he has for his onscreen accomplishments. In 2004 he received the highest honor of the Boys and Girls Clubs of America, an organization to which he belonged in his youth and now gives back to as a board member, donor, and longtime spokesperson. He is also a board member and supporter of Fisher House Foundation, which provides housing for the families of military personnel undergoing medical treatment. He has given generously to many other important causes, including children’s organizations and educational institutions. Last year, he and his wife, actress Pauletta Washington, received the Prince Rainier III Award of the Princess Grace Foundation–USA for their philanthropy and contributions to the arts. Mr. Washington earned a bachelor’s degree from Fordham University in 1977 and later trained with San Francisco’s prestigious American Conservatory Theater. He is the author, with Daniel Paisner, of the New York Times best seller A Hand to Guide Me: Legends and Leaders Celebrate the People Who Shaped Their Lives. Dr. Renée C. Fox is a pioneer in the field of medical sociology. Known for her innovative and daring thinking, Dr. Fox spent more than half a century delving into societal and cultural questions associated with medical research, therapeutic innovation, medical education, and medical ethics. Her many writings, based on decades of fieldwork traversing North America, Europe, Africa, and Asia, include Experiment Perilous: Physicians and Patients Facing the Unknown; The Sociology of Medicine; In the Belgian Chateau: The Spirit and Culture of a European Society in an Age of Change; and with Judith P. Swazey, The Courage to Fail: A Social View of Organ Transplants and Dialysis, Spare Parts: Organ Replacement in American Society, and Observing Bioethics. Her 2010 work, In the Field: A Sociologist’s Journey, is an account of her life as a sociologist. 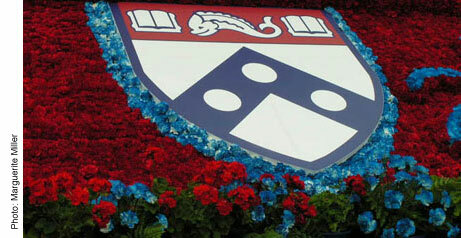 Dr. Fox is the Annenberg Professor Emerita of the Social Sciences at the University of Pennsylvania. Dr. Fox was among the first women to be named a full professor, to hold an endowed chair and the first woman to chair an academic department. In addition, Dr. Fox taught and held secondary appointments in Medicine, Nursing and Psychiatry during her more than 40 year association with Penn. She is also an emerita senior fellow of Penn’s Center for Bioethics. Before coming to Penn in 1969, Dr. Fox was a member of the Columbia University Bureau of Applied Social Research, taught at Barnard College for over a decade, and served as a visiting lecturer at Harvard University. A graduate of Smith College, she earned her PhD in sociology from Radcliffe College, Harvard University, in 1954. Dr. Fox is a member of the American Academy of Arts and Sciences and the Institute of Medicine of the National Academy of Sciences, a fellow of the American Association for the Advancement of Science, and an honorary member of Alpha Omega Alpha Honor Medical Society. She has received the Lifetime Achievement Award of the American Society for Bioethics and Humanities, the Radcliffe Graduate School Medal, the Centennial Medal of Harvard University’s Graduate School of Arts and Sciences, the Leo G. Reeder Award for Distinguished Contributions to Medical Sociology, the E. Harris Harbison Gifted Teaching Award, and a Lindback Award for Dustinguished Teaching, as well as 11 honorary degrees. The Belgian Government named her Chevalier of the Order of Leopold II in 1995. Mobile communications expert Mo Ibrahim once founded a company that brought cellular telephone service to more than a third of the population of his native Africa. Now, through the foundation he created in 2006, he is a leading voice for the advancement of good governance throughout the continent. In 1998, when Dr. Ibrahim founded the mobile telephone company Celtel International to build and operate mobile networks in Africa, there were only 2 million cellular phones in use there. When he sold the company seven years later, there were more than 100 million on a continent where inadequate landlines had previously hampered economic development. Dr. Ibrahim used the proceeds from the sale of Celtel to launch the Mo Ibrahim Foundation, an organization dedicated to strengthening governance and leadership in Africa. The Foundation focuses on two major initiatives: the Ibrahim Index of African Governance, an annual rating of the quality of governance in African countries, and the Ibrahim Prize for Achievement in African Leadership, which recognizes excellence in leadership. With its accompanying award of $5 million over 10 years and $200,000 annually for life thereafter, the Ibrahim Prize is considered the largest annually awarded prize in the world. In 2008, Dr. Ibrahim was listed by Time magazine as one of the 100 most influential people in the world for these efforts. Dr. Ibrahim earned a bachelor’s degree in electrical engineering from the University of Alexandria and a PhD in mobile communications from the University of Birmingham. After a long career in academia, he spent six years as technical director for Cellnet, a subsidiary of British Telecom, then founded the consultancy and software company, Mobile Systems International, before launching Celtel. Dr. Ibrahim holds five honorary doctorates and is an honorary fellow at London Business School, the Royal College of Engineers, and Cornell University. For his contributions to Africa, he has received honors such as the Economist Innovation Award for Social & Economic Innovation, Ordre national du Burkina Faso (Officier), Commonwealth Business Council–Africa Business Award for Lifetime Achievement, FIRST International Award for Responsible Capitalism, Oslo Business for Peace Award, Raymond Georis Prize for Innovative Philanthropy in Europe, and the Clinton Global Citizen Award. In the 1970s, organic chemist Dr. Ei-ichi Negishi developed an innovative method for using the metal palladium to link carbon molecules into larger, more complex structures. The process, called palladium-catalyzed cross-coupling, gave scientists an efficient and highly precise means to synthesize a multitude of vital compounds that previously had been difficult or impossible to attain in adequate quantities. The method is now used in research and industry worldwide to create substances with purposes as diverse as fighting AIDS and cancer, protecting crops, contributing to DNA sequencing, and illuminating the ultra-thin monitors that have revolutionized so many endeavors. For this discovery, Dr. Negishi received the 2010 Nobel Prize in Chemistry, which he shared with Dr. Richard Heck of the University of Delaware and Dr. Akira Suzuki of Hokkaido University in Sapporo, Japan, for their respective contributions to palladium-catalyzed cross-coupling. Today, Dr. Negishi is the Herbert C. Brown Distinguished Professor of Organic Chemistry at Purdue University. Dr. Negishi, who earned his doctorate in organic chemistry at the University of Pennsylvania in 1963, is the seventh person affiliated with Penn’s Department of Chemistry to receive a Nobel Prize. He came to Penn in 1960 after receiving a bachelor’s degree in organic chemistry from the University of Tokyo in 1958 and subsequently working in industrial research. In addition to the Nobel Prize, Dr. Negishi has received many other prestigious awards for his work, including the American Chemical Society Award for Creative Work in Synthetic Organic Chemistry, the Chemical Society of Japan Award, the Philadelphia Organic Chemists’ Club’s Allan R. Day Award named for Dr. Negishi’s dissertation advisor at Penn, the Yamada-Koga Prize of the Japan Research Foundation for Optically Active Compounds, a J.S. Guggenheim Memorial Foundation Fellowship, and his country’s highest distinction, the Japanese Order of Culture. Since the 1970s, his pioneering work has been mainly supported by the National Institute of General Medical Sciences, one of the National Institutes of Health, and the National Science Foundation. He is the author of two books, including The Handbook of Organopalladium Chemistry for Organic Synthesis, and more than 400 research papers cited collectively over 20,000 times. Joyce Carol Oates is the author of a distinguished number of works of prose fiction, poetry, plays, and non-fiction; since the early 1960s her work has illuminated, for readers around the world, timely and urgent themes of political and domestic violence, racism, socio-economic crises, and the ongoing vicissitudes of the American Dream. Ms. Oates received a bachelor’s degree in English in 1960 from Syracuse University, where she graduated as valedictorian. She went on to earn a master’s degree in English from the University of Wisconsin in 1961. She has taught at the University of Detroit; the University of Windsor in Ontario, Canada; and Princeton University, where she is the Roger S. Berlind ’52 Professor of the Humanities and a professor of creative writing in the Lewis Center for the Arts. A member of the American Academy of Arts and Letters, Ms. Oates has received numerous awards for her literary accomplishments, including the 1970 National Book Award (for them), the PEN/Malamud Award for Excellence in Short Fiction, the O. Henry Special Award for Continuing Achievement, the Common Wealth Award for Distinguished Service in Literature, the Chicago Tribune Lifetime Achievement Award, and the National Book Critics Circle Ivan Sandrof Life Achievement Award. 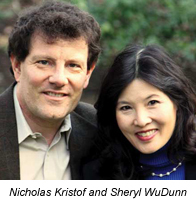 In 1990, journalists Nicholas D. Kristof and Sheryl WuDunn became the first husband-wife team to receive the Pulitzer Prize in journalism for their knowledgeable and often perilous coverage of the 1989 pro-democracy movement in Beijing’s Tiananmen Square. Their most recent book, Half the Sky: Turning Oppression into Opportunity for Women Worldwide, chronicles the oppression that women face around the world. Half the Sky is now the basis of a new multimedia initiative to help fight poverty and raise the status of women around the world. They are also the authors of the best-selling books Thunder from the East: Portrait of a Rising Asia and China Wakes: The Struggle for the Soul of a Rising Power. Since joining the New York Times in 1984, Mr. Kristof has covered economics and presidential politics; held the position of bureau chief in Hong Kong, Tokyo, and Beijing; and served as associate managing editor responsible for the Sunday editions. Now an op-ed columnist for the newspaper, he was awarded a second Pulitzer Prize in 2006 for his commentary on genocide in Darfur. Known for traveling throughout Africa and Asia to develop an intimate awareness of the atrocities on which he writes, Mr. Kristof has been described by South African Archbishop Desmond Tutu as an “honorary African” and by New Yorker writer and CNN analyst Jeffrey Toobin as the “Indiana Jones of our generation of journalists.” Mr. Kristof has been honored with the Michael Kelly Award, the George Polk Award, the Overseas Press Club Award, the Online News Association Award, the Dayton Literary Peace Prize for Lifetime Achievement, and the American Society of Newspaper Editors Award. He graduated from Harvard University and earned a law degree, as a Rhodes Scholar, at Oxford University. He is the subject of the documentary, “Reporter,” which premiered at the Sundance Film Festival in 2009. Ms. WuDunn, the first Asian-American reporter to have won a Pulitzer Prize, is now a senior managing director at the investment bank Mid-Market Securities and president of the social investing consultancy TripleEdge. She was previously an executive at Goldman Sachs & Co. and at the New York Times, where she also served as an editor for international markets, energy, and industry; a foreign correspondent in Tokyo and Beijing; and the inaugural anchor of an evening news program on its related cable channel, Discovery Times.Her many honors include the Dayton Literary Peace Prize for Lifetime Achievement, the George Polk Award, the Beacon Award of the White House Project, and awards from the Overseas Press Club. She holds an undergraduate degree from Cornell University, a master’s degree in business administration from Harvard University, and a master’s degree in public administration from Princeton University.